Mysore Palace is located at the center of the Mysore city. 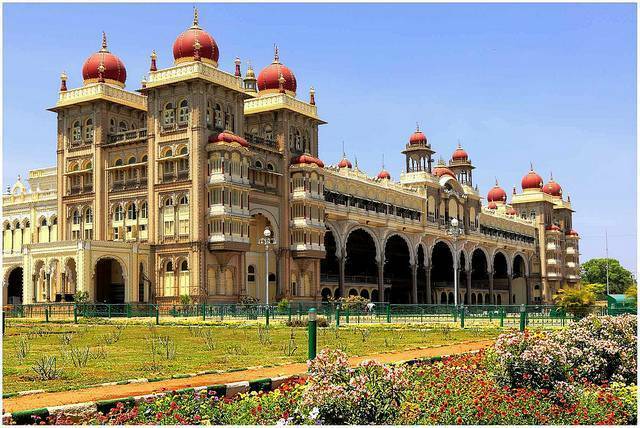 The Mysore Palace, also known as the Amba Vilas Palace, is considered as the pride and soul of the city of Mysore. The palace falls under the legacy of the Wodeyar Dynasty and was originally built in 1897. However, due to historical tragedies, it had to be rebuilt a few times. The current Mysuru Palace was the brainchild of the architect Henry Irwin. It was built in 1912, for the 24th Ruler of the Wodeyar Dynasty. Today the Royal family continues to occupy a part of the palace, while the rest has been turned into a state-owned museum. The palace is a three-storied Indo-Saracenic structure, which has beautifully designed square towers which are covered by domes. Tourists can come across some of exquisite carvings and artworks in this palace. The open courtyard in the center of palace is covered by gold plated dome. During Dussera festivals, the palace is elegantly decorated by lights and the 200 kg gold throne of Wodeyar king will be displayed for public.The palace can be entered through the “Gombe Thotti" or Doll's Pavilion which contains traditional dolls from varying time spans and a wooden elephant decorated with gold. The walled palace complex houses the Residential quarters and the Museum, temples, shrines and some other holy spots. One popular temple located in the palace is the Shwetha Varahaswamy temple.The palace provides a spectacular view of the Chamundi Hills which falls towards its eastern side. The royal throne in the "Diwan-I-Am”, the elephant March during the Dasara festival, the hallway of doors, portrait gallery and the Kalyan Mandapa or Marriage Pavilion are some of the various attractions that, the Mysore Palace is known for. Photography is not allowed inside the palace, only on the palace grounds, So take pictures before entering the palace.